John’s Horror Corner: Sinister 2 (2015), an unworthy sequel squandering its boogeymen Bughuul for creepy ghost kids. MY CALL: I guess it’s watchable, but this sequel really isn’t worth it. 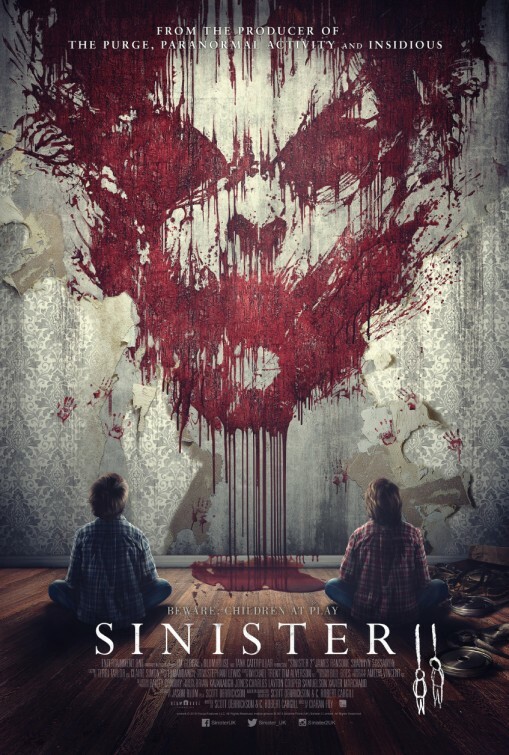 MORE MOVIES LIKE Sinister 2: Well I, for one, loved the first Sinister (2012). But in all fairness, people have different taste. So, here’s a second opinion (review here) from the other half of MFF. For more murderous horror twins, try Goodnight Mommy (2014). Fleeing an abusive husband, Courtney (Shannyn Sossamon; Wayward Pines, Sleepy Hollow, One Missed Call, The Day) secretly moves to a family-owned property with her twin sons, Dylan and Zach. Little did she know, something awful happened at the property. Her sons are the worst twins ever. They fight constantly and rely on each other for nothing. Dylan is a special boy. He’s been seeing the boogeymen in his closet, having freaky nightmares and macabre daytime visions, and he has some ghostly young friends who share old 8mm family snuff films. For whatever reason, Zach not only knows about all this, but he’s jealous! Our now-ex-deputy (James Ransone; Sinister, Prom Night) senses the horrors that befell the Oswalt family (in part 1) will somehow happen again at Courtney’s hideaway. He befriends, warns, and protects Courtney and the boys. Then, you know, things get worse. Even when we see them coming, some of the death scenes are unexpectedly shocking. They feature immolation, alligator attack, electrocution…but they seem to fall short of the horrifying impact they had in part 1. We seem to just be going through the motions. It feels like the filmmakers tried, but were just less inspired than the original Sinister (2012) team. Moreover, Bughuul just didn’t feel right. He seemed more… “human.” Less other-worldly; less demonic. Bughuul, the eater of children, remains unnaturally unnerving. But however creepy he is in this film, it’s still notably “less” than he once was. Another downgraded aspect of this sequel is that everything seems too “organized.” Bughuul has hired kid ghost interns to do his recruiting and he seems to be running an undead kinder-horror school complete with a home video film curriculum. There’s practically a schedule and demerit system. The terror of discovery (previously endured by Ethan Hawke) just isn’t here, and it’s the very thing that gave the original it’s gut-punching impact. At least it’s rated-R—as horror should be. None of part 1’s soul-rattling magic is to be found here in director Ciarán Foy’s (Citadel) sequel, and the third act is most disappointing of this sequel. Sigh… oh well. The film was mildly entertaining and I don’t regret giving it a shot. But, that said, I’m not recommending this to anyone. It really has no merits. Shame. ← John’s Horror Corner: Beyond the Gates (2016), an evil VCR board game movie with a distinct 80s feel. I completely agree. I loved the first Sinister too, and found this sequel disappointingly uninspired. The acting isn’t as good either. Yeah, some weren’t fans of part one, but I adored it! Got me to jump a bit, and that’s really hard. Plus, it built tension. This sequel had about zero tension–just jump scares.